This was made for the ICA Print Portfolio, a project initiated by the artist Richard Hamilton and which featured work by most of the leading artists of the day. The print is closely related to the subject matter of his paintings at the time. The image was based on a photograph in the American magazine Physique Pictorial and appropriated a fragment from a screenprint by Harold Cohen to suggest escaping water. 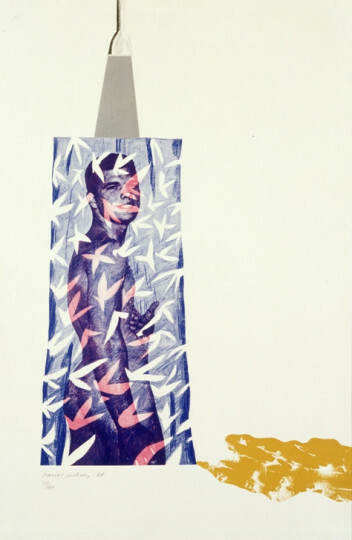 This is one of Hockney’s rare screenprints, and he has only used the process in combination with other media – such as Figure by a Curtain (P823), also in the British Council collection. A permanent image taken by means of the chemical action of light on light-sensitive surfaces. A set of pictures (as drawings, photographs or prints) either bound in book form or loose in a folder. These can be by the same artist or individual works by a selection of artists. The term also refers to the folder which holds the set.